It seems to me that I’m going through a breakfast phase. Eggs at most meals, bacon at dinner. This is good for the winter. It’s cold, it’s comforting to have maple syrup on the table. It reminds you that the sap will be rising again soon, tapped by our friends the farmers. Rising sap means spring can’t be too far off. Tell that to the ice storm that’s supposed to be coming through tonight, but I digress from my pretty story. Saturday morning, Cherub wanted waffles. Being the loving, indulgent mother I am – don’t snicker derisively, you – I set to doing it right after a large cup of coffee away. Curses that we were out of butter. No matter, it seems. 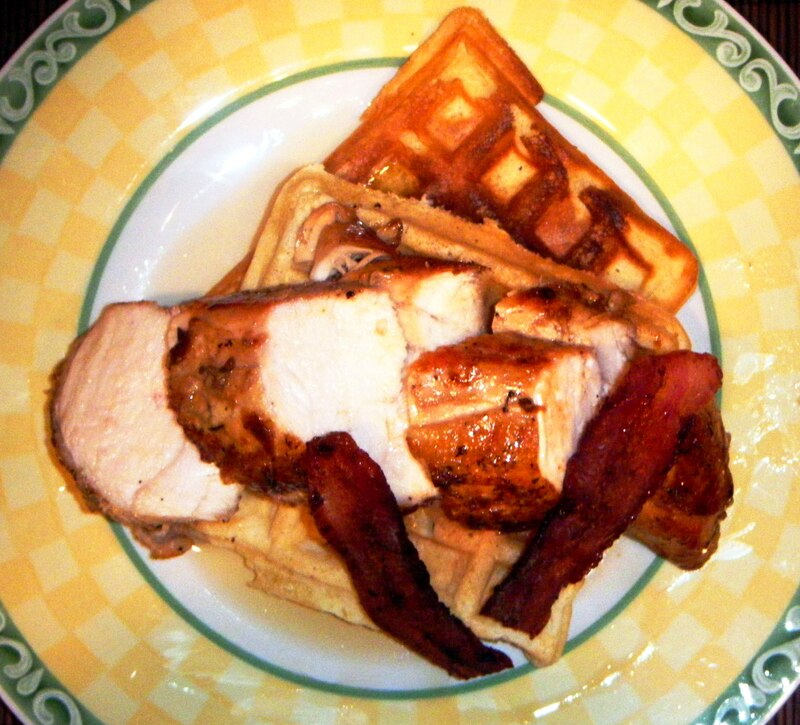 Mr. James Beard himself says waffles are just delicious with bacon fat. Well, certainly! Now before you go shaking your head and saying, “How can a loving mother feed her child bacon fat!? !” It’s really very easy. You just don’t do it every day. So a good batch of waffles were sitting in the fridge, leftover, insisting that something to be done with them. Chicken and waffles is the obvious choice. But I wasn’t about to serve fried chicken with those bacon-y waffles, although that would have been divine. I opted for a lighter version, a pan seared chicken breast. I do go for the bone in, skin on version, as it makes for a tastier, moister breast. It’s easily de-boned before serving, takes all of about 15 seconds, really. You have fifteen seconds, don’t you? And if you want really, good, fresh chicken, stop by North Market Poultry and Game. They have the very best here in Columbus, bar none. The best way to cook a chicken breast (or two) is to season it generously with salt and pepper and sear it in a 10-inch pan that’s got some good (and hot) olive oil in it. Let it brown very well, skin side down first, then flip it over and brown the other side as well. Add in about a cup and a half of chicken stock, a sprig of thyme and a clove of crushed garlic, bring to a simmer and reduce the heat to cook fairly slowly, turning and basting the chicken until it’s done. Twenty to thirty minutes or so should do the trick. Also by this time, your stock should be just about reduced to nothing. Snug up the curved sides of the breast to the sides of the pan to get a good last bit of browning on them then pull them out to rest a few moments while you toast the leftover waffles and heat up the syrup. To serve, remove the bones from the chicken (and the skin if you must) and slice. Place on top of the waffle. Add a slice of bacon or two if you want some extra protein. Drizzle generously with maple syrup and cross your fingers spring comes sooner rather than later. Playlist included Radioactive by Kings of Leon. Do not get the wrong idea: Persephone is not hung over. She doesn’t get hung over. Let’s just get that straight first. But I do know that this is a malady that occasionally affects those fashionable folks who enjoy a nice meal with a few (extra) glasses of wine. A sturdy, spicy breakfast lunch the next morning midday with a good strong bit of coffee is just what Persephone thinks you need, if you’re one of those fashionable folks. And the refreshing thing about this is that you can be as creative as you like (or as creative as your refrigerator allows). The only basics you need are pork, eggs and tortillas. For the migas this morning, it was a mash-up between a Spanish version that’s heavy on the pork products and the Tex-Mex version that’s heavy on the tortillas. 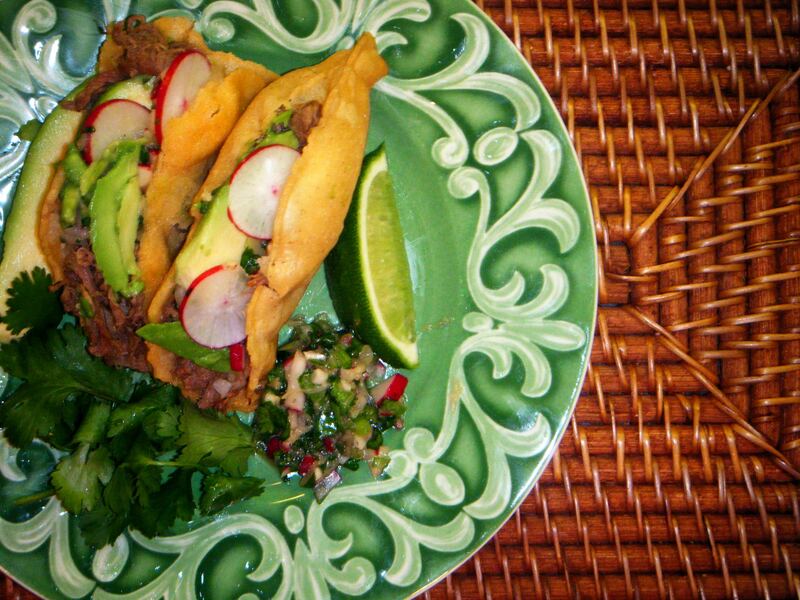 Typically the Spanish version uses breadcrumbs, but we have nine zillion corn tortillas in the fridge so there you have it. To get started, I fried up some chorizo that was sliced into thick chunks, and a few slices of bacon that had been chopped into five or six pieces. While this was frying over slowish heat, I soaked some corn tortillas in water that was seasoned with salt, some slices of jalapeno, and smashed garlic. I also chopped up a couple of tiny potatoes and some fennel tops that we had in the fridge. I whisked a couple of eggs together and added in a handful of watercress that was feeling lonely. When the bacon and chorizo was just about crisp, I drained the tortillas and dried them then sliced them into thin strips. I tipped in the tortillas, potatoes and fennel and let it cook a few minutes until most had crisped a bit (not too much, mind you) then added in the eggs and cress. 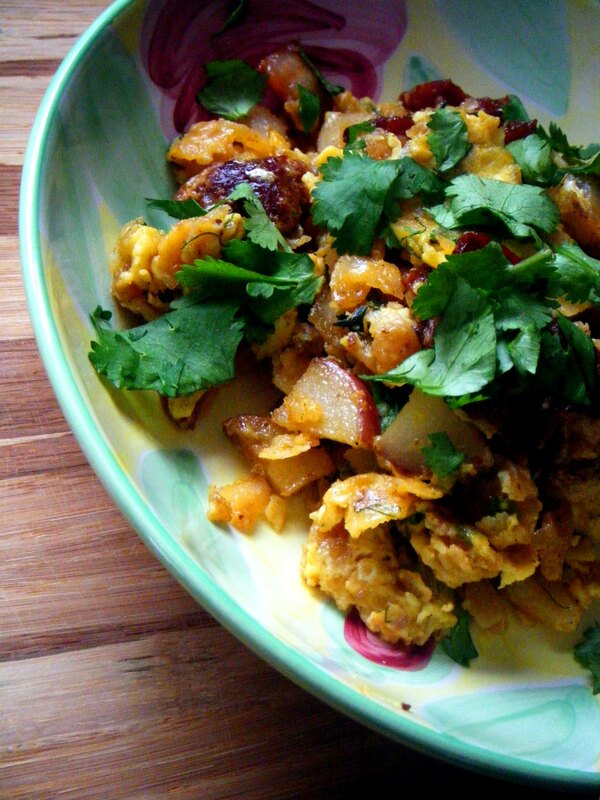 Stir and cook until the eggs are the consistency you like then divide into bowls and top with a bit of chopped cilantro. This is pretty seasonal right now, but certainly in the warmer months, you might add tomatoes or kernels of summer corn instead of the fennel and potatoes. There’s also a plethora of cheese choices you can add to this everything from cojita and queso fresco (my favorite) to the shredded four cheese blends you get at the store (not so much my favorite, but entirely do-able). Make sure you set a bottle of sriracha on the table for those that need a bit more help waking up and facing the day. Playlist included Help, I’m Alive, by Metric. I recently followed a debate/skirmish happening in the Atlanta area between a restaurant critic and some local chefs. Let’s just say the chefs carried the day. One wonderful chef who responded quite eloquently was Ron Eyester, or The Angry Chef of Rosebud in the ATL. I discovered, not only is he tremendous in an argument, but he’s doing something fun at his restaurant: Monday Night Brunch. Well, why on earth not, I asked myself? So here’s Persephone’s version. 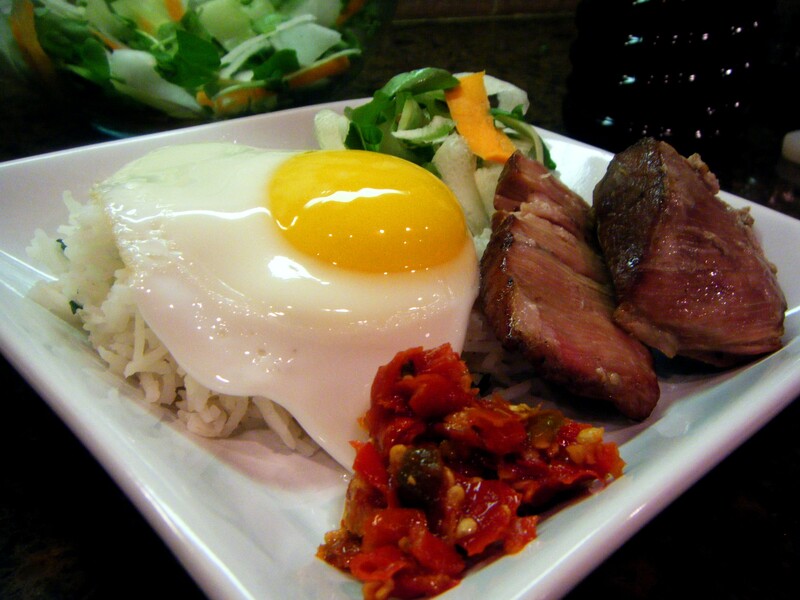 It’s a Korean, Seoul-food classic called Bibimbap. With braised pork belly, a completely naked salad and a beautiful sunny side up egg on top, it’s a well-balanced dish that’s colorful, light, fresh and fun. It’s bacon and eggs, kids, just with some Far Eastern flair. So grab a Bloody Mary and some coffee and you’re good to go all night long. I was so excited to be invited to a cool little supper club started by a friend here in Columbus. The ingeniously-themed meet up was entitled Showcase of the Crusted Arts. Meaning bring something with a crust on it somewhere. The smart and gracious hosts cooked up a beautiful whole striped bass in a salt crust. Other clever folks brought goat cheese pizza, clementine pie, Hot Pockets, pork pie, spanakopita, all sorts of deliciousness. I wanted to make something that would travel fairly well and have something substantial and savory, if perhaps a bit non-traditional, as a crust. 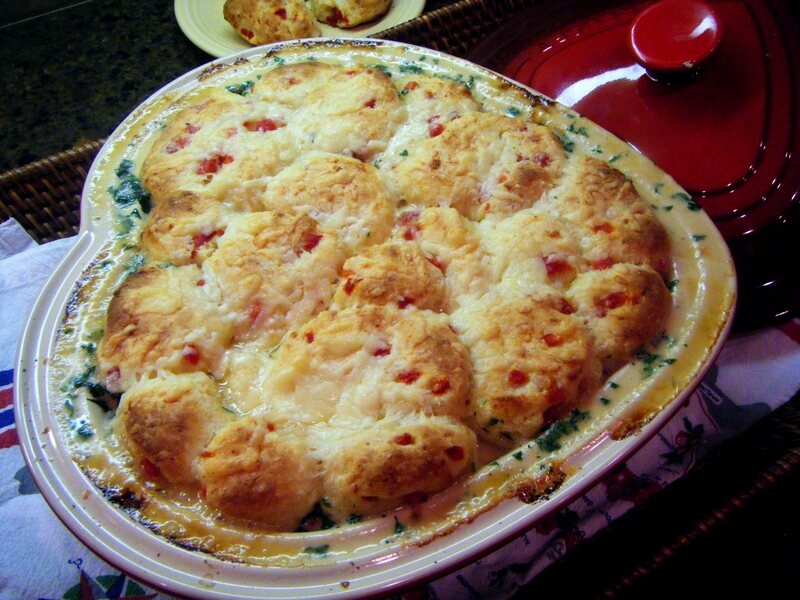 Enter a pot pie of sorts with crab and shrimp, topped with Georgia-inspired pimento cheese biscuits. Kosher it ain’t, but it was good. A trip to an Asian market is so heavenly. Those markets are filled to the brim with flavor and inspiration. My favorite Japanese shop is Tensuke Market. It’s where I get my yuzu and some of the most delicious soy sauce ever. It’s where you can pick up really fresh sushi, and carefully crafted bento boxes. It’s also where I found the shumai wrappers for today’s Philippine siomai. 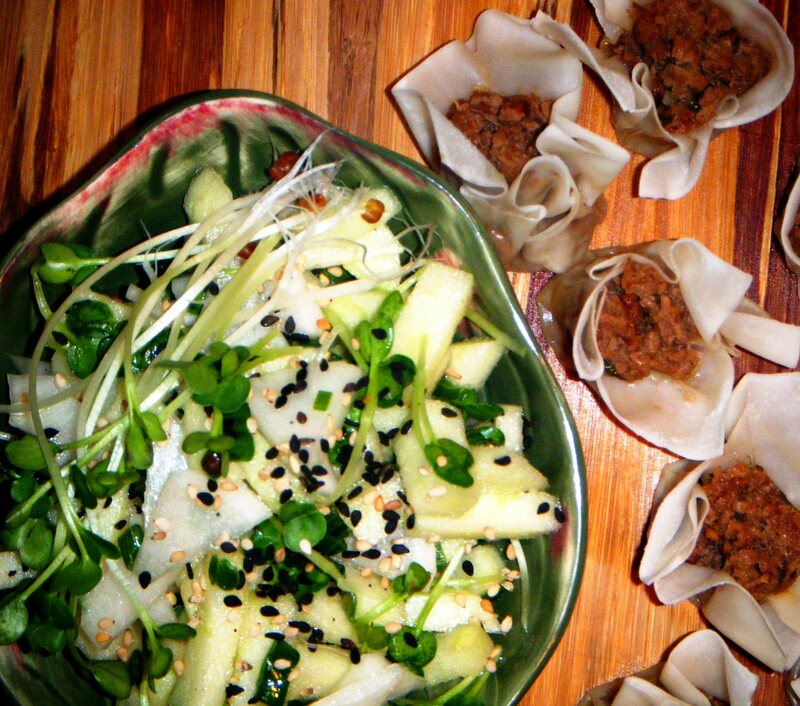 The Japanese don’t typically fill shumai with beef, but it’s common in the Philippines. 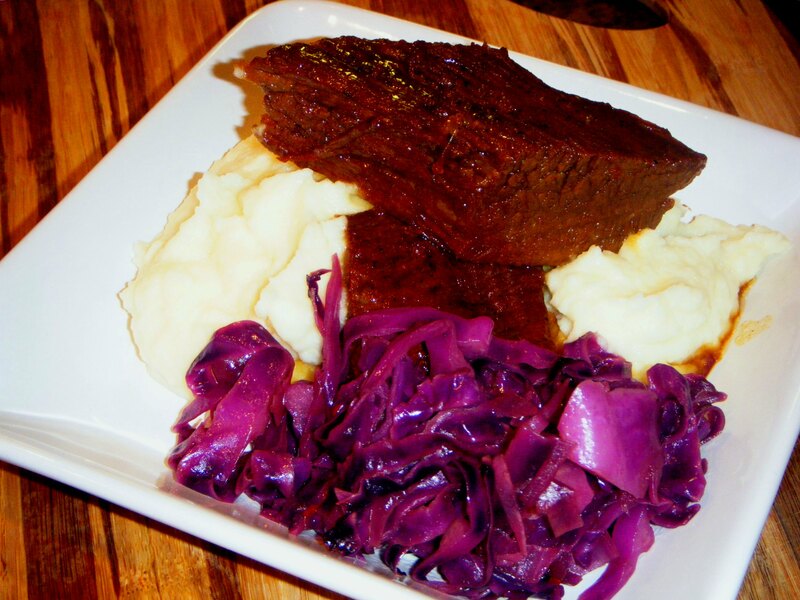 So with a little nod to a couple of different cultures, I wound up with a really tasty appetizer that’s a snap to assemble and serve thanks to the leftover brisket.